Gifted defense attorney Ray Shekar (Sachin Mehta) finds himself in the middle of a twisted game of who-done-it when his curiosity prompts him to take on the case of Allyson Daugherty (Kristina Klebe), a socialite accused of murdering her husband. Ari Larsen has resurfaced after a five year absence, still harboring the memories of a scarred childhood. Kidnapped at the age of eleven by her serial killer father, Professor David Larsen, and taken on a three week odyssey of murder and savagery, Ari was left abandoned in the desert. One horrifying fact remains; her father has never been captured. Malcom’s done with his life. Only the noise of Crystal Meth gives him a reason to keep going. Equipped with a bag full of weapons and self-made bombs, he makes his way to the nearby mall to really stir things up. Against the tranquil backdrop of a game reserve, South African thriller Night Drive tracks a group of tourists left stranded during a night-time game drive after their vehicle breaks down. Johnny Yong Bosch (Bleach, Mighty Morphin Power Rangers, Broken Path) and Eric Jacobus (Contour, Dogs of Chinatown) star in this year’s hardest-hitting martial arts action thriller! 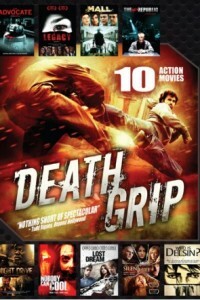 Featuring action by acclaimed director Eric Jacobus and The Stunt People, “the premier action team” (Kung Fu Cinema), Death Grip is not your typical martial arts action film – it will keep you in its grasp until the very end! New Angeles, the isolated crime capitol of L.A., is home to David Kosinski, a young writer expelled from college and sentenced to house arrest. In solitude his politically charged blogging soon strikes a nerve with the leader of an underground nationalist group. Merely stirring the pot the majority of his life, David’s final decision is now a matter of life and death. NOBODY CAN COOL is a suspenseful thriller of a young couple, Susan and David, who travel to the mountains for the weekend where they find their borrowed cabin already occupied. Tensions and secrets fueled by fear, greed, and suppressed hostility bubble over, and the pending arrival of an unknown danger becomes a test of survival. Emotionally distraught and depressed, Perry Roberts (Michael Welch) has lost faith in all the things he held true – and engages in an emotional roller coaster fueled by drugs and a dangerous game of Russian roulette. In July 2009, Pulitzer Prize winning Journalist Gerard Martinez walked into the Tampa Bay Museum of art and opened fire. He mercilessly killed men, women, and children before turning the gun on himself. The event came to be known as one of the bloodiest crimes in Tampa Bay history.